Many people have asked, and we have listened. What does a walkabout mean? The answer is simple…kind of. First, we wanted a name that truly represented our unique experiences. While we conduct guided walking tours, we aim to make it more than just a tour of facts and tastings. Our experiences are about exploring and discovering things that makes a destination unique. It is about truly getting to know a community and what it is like to be apart of it. Second, we wanted to recognize the diversity in Napa. As you will learn in this article, the word walkabout originated in Australia. And one thing you should know about California wine country, there are plenty of Australians. Apparently, where there’s wine there will be Aussies. And finally, our walkabouts don’t follow a route you will find on a map. Our walking paths are something only a local would know. And while our tours are carefully organized, simply walking about is what we want it to feel like for our guests. So where did the term walkabout originally start? As mentioned above, the term originated in Australia. The term walkabout evolved to describe the “temporary mobility” of a nomadic indigenous Australian. “Temporary mobility” is a nomadic lifestyle that does not establish a permanent residence and includes a significant amount of movement for religious observance. Young Indigenous adults have the highest mobility rate of all age groups in Australia. A walkabout is their rite of passage during which indigenous males undergo a journey during adolescence. This journey meant a person would live in the wilderness for a period as long as six months to make the spiritual and traditional transition into manhood. Although this is the origin of the term walkabout, as with many things, the term has taken on to mean a variety of things. One of the most popular uses of the term “walkabout” is by British Royals. Their version is when members of the royal family meet well-wishers gathered on the street. In earlier tours, viewers would only be able to catch a glimpse of the royals when they drove by in cars. But that changed during the Queen’s tour of Australia and New Zealand in 1970. It was during this trip that the Queen decided to personally greet royal watchers. She wanted to say hello to the crowds, and the walkabout was born. The new activity allowed royals to meet a greater number of people, not just officials and dignitaries. Now, well-wishers can actually get handshakes and have short conversations with members of the royal family. And at this point, almost every public royal engagement involves a “walkabout”. Since the term first originated, it has taking on a variety of meanings. And according to Urban dictionary here are just a few of the most popular. A walkabout can be a spontaneous journey through the wilderness of one’s choosing in an effort to satisfy one’s itchy feet. Or it can be a trek that has no goal other than admiring nature, and the personal satisfaction of walking around the middle of nowhere and making it home alive. And one definition that is gaining more popularity is the highly selective alternative program for college bound high school seniors. The program consists of several challenge areas to teach students to love learning and help them to make it in the real world. So what do we mean by Paper Napan Walkabouts? First, let’s breakdown Paper Napan. This term is used to describe a non-native local. Why that? Well first, people from Napa are called Napans. And second, residents up valley have been known to call Napans “Napkins”. And rather than taking offence, locals have taken this and embraced the term. In addition, urban legend has it that natives refer to themselves as linens and non natives as paper. Since our mission is to create a local experience for our guests, you will be an honorary Paper Napan for the day. What do we mean by walkabout? As mentioned above, we wanted something that represents our unique experience. This is more than a tour about facts of a destination. It’s more than tasting wine and beer and seeing unique art. Our goal is to immerse our guests in the local culture and make you feel closer to the community. And there is no better way to do this than walking around with a local with great relationships around town. Overall, Paper Napan Walkabouts believes that the character of a community is what truly makes each destination unique. 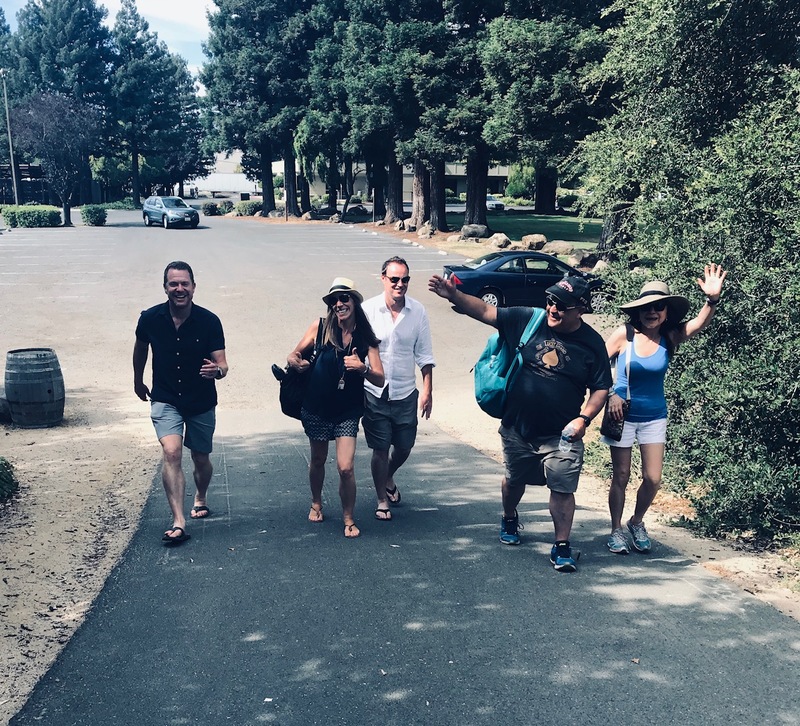 And we have created an experience that highlights the soul of Napa through art, wine, beer, walking, and really cool locals at each stop.